Pairing suits with patterns successfully isn’t as difficult as it may seem. The overall effect that patterns have on the eye is quite remarkable and it therefore takes a special skill to marry different shapes, colours and textures together. Luckily there are a few easy steps you can take to help add multiple patterns into your wardrobe. An easy way to begin anything in styling is to start with the basics, which in this case are the “Neutrals” or solid coloured suits (Navy, Grey, Brown, Black, even Green). 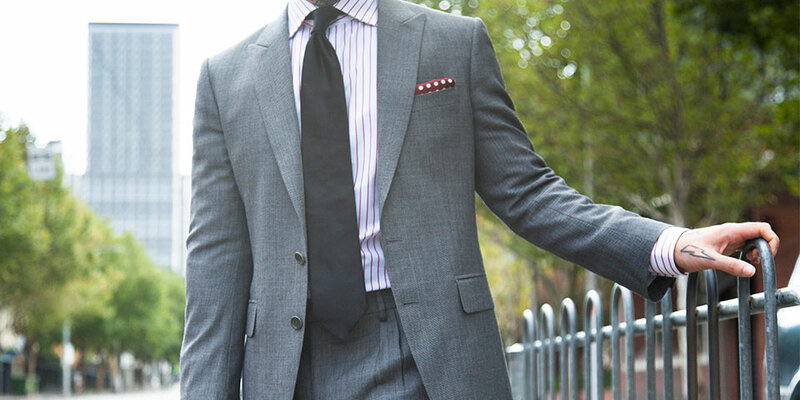 When wearing solid suit colours, using patterns in shirting and accessories work best. The pattern should always be different sizes when layering on top of each other, because if the patterns are the same size it will visually play tricks on the eye, and some will even find it hard to look at. For the intermediates who have become comfortable with the solid colours, it is time to move on to the patterned suiting. An easy first step would be selecting a subtle pattern, one that looks solid from afar but is noticeable up close, for example Herringbone, Shadow Checks, Birdseye, Nailhead, Sharkskin and some fine Pinstripes are all good starts. Wearing a more prominent patterned tie with a solid (neutral) shirt will work best as a base after which you can try swapping the shirt and tie patterns. Now we enter a more advanced level - mixing two noticeable patterns. The first step is to separate the two patterns by a solid colour (mainly via the shirt). Moving forward, pattern on pattern is where size will come into play the most. For example, a large check jacket with a fine pinstripe shirt work in harmony together, a small check jacket with a large “butcher” stripe shirt will also work, but when the patterns are of similar size and on top of each other it makes it hard to stay focused whilst looking at this combination. Finally, we come to something for the pros of pattern mixing - three or more patterns together. Yes, it can be done with ease with a simple trick of using large patterns on the jacket/suit and tie, with a smaller pattern on the shirt or vice versa. The more advanced will go into mixing a large check jacket/suit with a small striped shirt and a medium paisley patterned tie.